Alice Russell is not a very likable woman. No one thinks or admits otherwise. So when she goes off by herself during a company teambuilding retreat, leaving her four co-workers behind in terrible circumstances, no one is surprised. Federal Agent Aaron Falk and his partner, Carmen Cooper, have been working behind the scenes with Alice, trying to pin financial crimes on her bosses. Alice came on this retreat with instructions to send the agents specific contracts. She has yet to comply. When she disappears, the possibility of retaining the paperwork disappears with her. Falk and Cooper head to the park to help other law enforcement officials search for the missing woman, but as the hours and days pass, hope of her recovery dwindles. The Australian bushland is treacherous, and also the site of four abductions decades earlier. No one has quite forgotten the terror of those days, and no one can put aside the possibility that it’s happening again. The women left behind each have their own story about what happened out in the wild. Falk and Cooper work together to piece together the stories. Did Alice’s assistant finally have enough and lash out? Did Alice’s childhood friend see something she’s not reporting? Was her boss telling the whole truth about the fight in the dilapidated cabin? Or did the company underling and recovering addict lose it in the stress of the situation? No one is coming forth who can line it out into a coherent story. Harper’s writing is beautiful and descriptive. The story, written in alternating scenes from the first days of the hike and the present-day search for the missing woman, is captivating and ominous. For anyone looking for a story with complex characters, intricate timelines, and dark undertones, this book is for you. The people are interesting, from the protagonists to the minor characters, and the plot keeps you guessing. 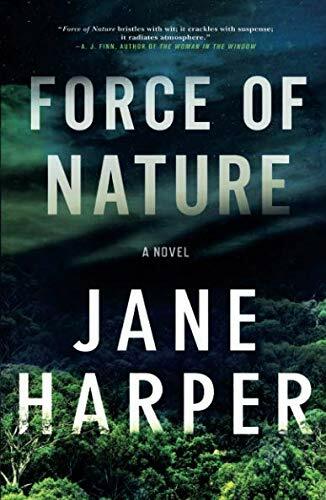 Force of Nature would be a great complement to a day spent by the fire—where you are dry and warm and safe, unlike Harper’s unfortunate cast of characters.